I love wearing subtle, pretty looks during spring and summer because I’m typically wearing a bright colored top. The problems I have with blogging about these looks are the details do not always translate in pictures, mainly due to my still limited knowledge of photography lighting. 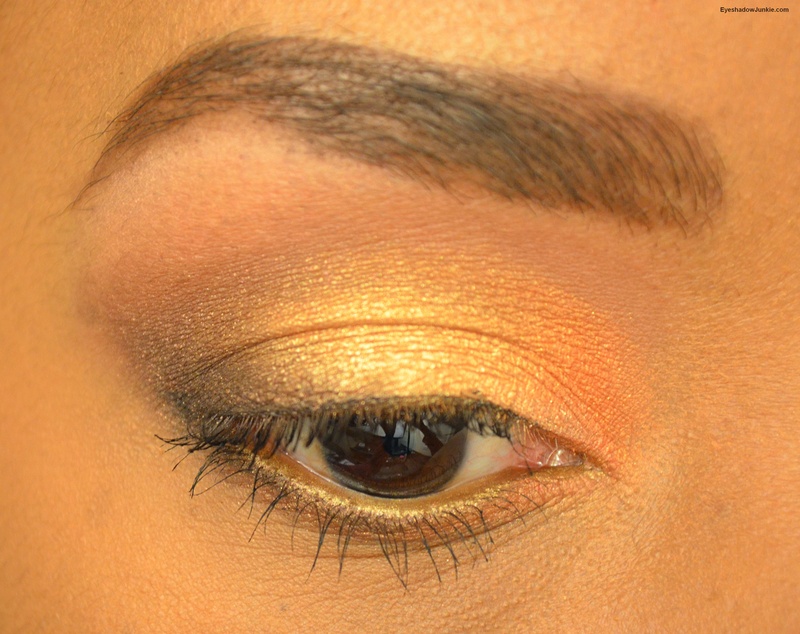 Enough complaining…here is a look using Estee Lauder’s Batik Sun eye palette. It’s a great palette for spring and summer. I applied a thin layer of primer on to prevent creasing. I also used a colored base for this look for the sake of the pictures. This isn’t necessary to get the colors to show up to the naked eye. I decided to use a bright orange base for the lid and a dark brown for the outer corner. I applied Fierce and Tangy first with a fluffy synthetic brush to the inner two-thirds and Rich Mahogany with a synthetic lid brush. 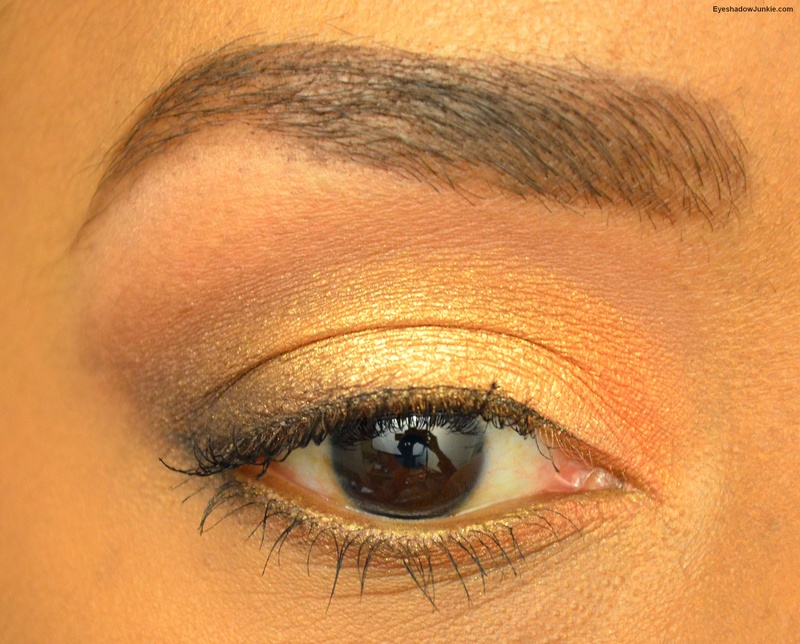 I blended the edges using a natural-haired brush and a skin-toned matte shadow (Mac’s Soft Brown). I took this shade up to the brow. Using a flat shader brush, I applied the pale gold shade to the lid except for the inner and outer corner. I applied the peachy-orange shade to the inner corner and lash line using the other side of the shader brush. I blended the edges using the same fluffy natural-haired brush. (Unfortunately, the orange isn’t that noticeable in the photo.) I put the dark brown onto the outer corner using a Hakuhodo crease brush. 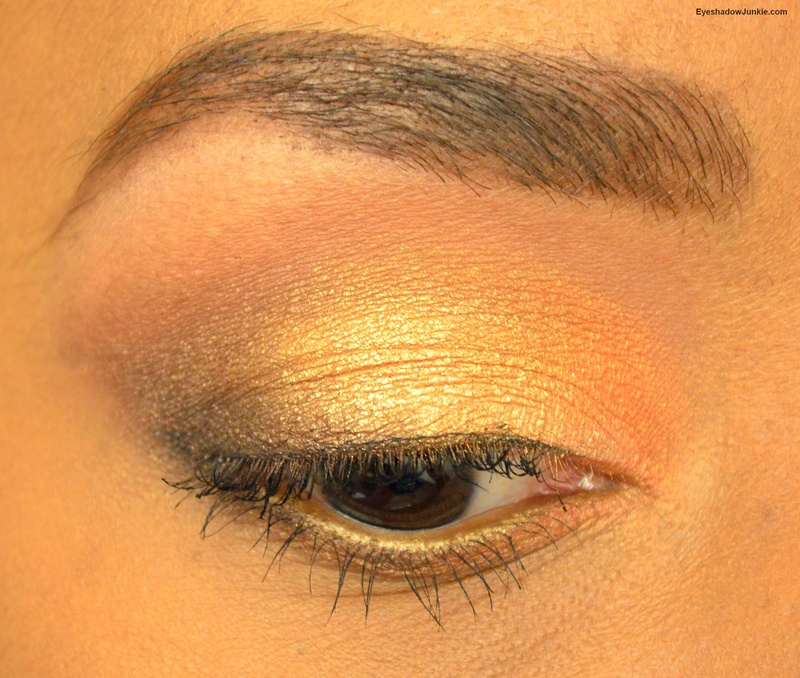 I concentrated the color near the lash line and blended over into the crease and ran the brush on my lower lash line. I darkened the lower outer corner using Coconut Grove. I lined my eyes with a dark brown gel liner using an INGLOT 30T angled liner brush. I chose a gold pencil liner to line my lower water line. I would pair this look with a soft orange cheek and soft neutral lip color. I like it too!. It’s a nice palette for summer.